If you buy only one smartphone accessory today, well, it should probably be Anker’s awesome 10W fast wireless charging stand, which is on sale right now at its best price yet. But if you buy two smartphone accessories today, the second one should definitely be the Silicon Power 128GB High Speed MicroSD Card. 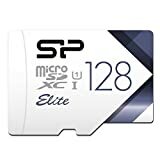 It’s just as fast and reliable as microSD cards from big names like SanDisk and Samsung, but it’s only $18.99 right now on Amazon.